In this series, I gave particular emphasis to some of the most frequent logical fallacies that I have encountered from atheists and leftists. There are quite a few, and some are even being "invented", but they are variations on a theme and fit into broader categories. I don't believe that there's a need to learn each and every fallacy by name. 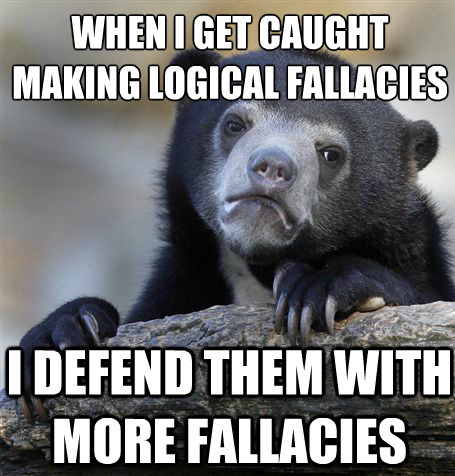 By the way, I suggest caution instead of tactlessly naming someone's logical fallacy during a friendly discussion. Especially when discussing Immanuel Kant while shooting a game of billiards at a biker bar. You'll probably look pretentious. But if someone is being a condescending jerk, go for it. Not at the biker bar, though. Like the guy who cries, "Libel!" while committing (documented) libel himself. Some fallacies are the monstrous illegitimate offspring of other fallacies. That is, they can be blended and compounded. There have been times when I have been hit with two or three fallacies in one paragraph, and have even been subjected to two or three in just one sentence. We can learn basic principles of clear thinking. There have been times when I have heard or read something that bothered me. I knew it was wrong, but was unable to easily identify a particular fallacy; I just knew that it was, perhaps, an attempted diversion from the topic at hand. Many people are blatant with insults, such as this gem posted at "The Question Evolution Project" page on Facebook: "Tough guy! lol take some classes and educate yourself so you dont sound like a complete fool to people who know what they are talking about.....you know your scientific illiterate audience thats how you get away with this nonsense....shame! Here is free course from Duke University. Take advantage of it...." Ironic that someone pretends to be the intellectual superior of the hundreds of people who "like" that page, and then has such ridiculous personal attacks and other logical fallacies, plus punctuation problems. Some are more skilled. This one is not great, but it's subtle: "I find the Hindu creation myth more plausible than the Genesis one." That remark was intended to provoke emotion. Appealing to emotions, pride and so forth can be used as ad hominems, straw man and red herrings at the same time. That is, people can get others angry and off-topic. Some people just want to waste your time, and when they play games like that, we can either call them back to the topic or cease discussion with them entirely. Again, everyone does not need to be an expert in every logical fallacy (The "Fallacy of Irrelevant Thesis" is related to the Straw Man fallacy. So what? In either case, we do not need to defend a position that we do not hold, or to be distracted on a subject that appears to be related.) We do need to be aware of distractions and attacks, and to be on guard for people attempting to manipulate our emotions. (Or when people just get manipulative in the first place.) Elections seem to be won and lost more on feelings than on issues. In the remaining weeks before the American voters decide on a new leader, people need to be on guard against manipulation and appeals to emotion. The same thing happens when having biblical discussions with atheists, cultists and the like. Watch for personal attacks, distractions, appeals to motive, attempts to manipulate and distract and so on. This series was presented with a twofold approach: First, as a means of self-defense. You should be able to know by now when you're being played. Second, to help give people some resources to think more clearly and to make more rational arguments themselves. Reading up on these things and writing the articles has helped me a great deal, and I detest being caught making fallacies in my own arguments. But I'm getting better! I hope you are, too. "Logical Fallacies and the Art of Debate"
"Logical Fallacies and Ethics in Everyday Language"